Trailhead and parking area are on Crotched Mountain Road in Greenfield, NH. Crotched Mountain Road is located off Rt. 31, 0.9 miles north of Greenfield. A large gravel parking area is located 1.5 miles down this road, on the left. Crotched Mountain, best known for the Crotched Mountain Ski Area, is also a fine hiking destination. A network of hiking trails exists on the mountain's south side, allowing for many possible hikes. Shannon's Trail, featured here, climbs to a near-summit ledge providing a great directional view. From the parking area, walk past the gate and begin your hike on a wide, dirt path (Shannon's Trail) gradually climbing uphill. Just a few feet up the trail is a clearing with a nice view to the south. The path travels uphill at a very gentle grade, reaching another clearing with an observation deck in 0.4 miles. From the observation deck, an westerly view of Mt. 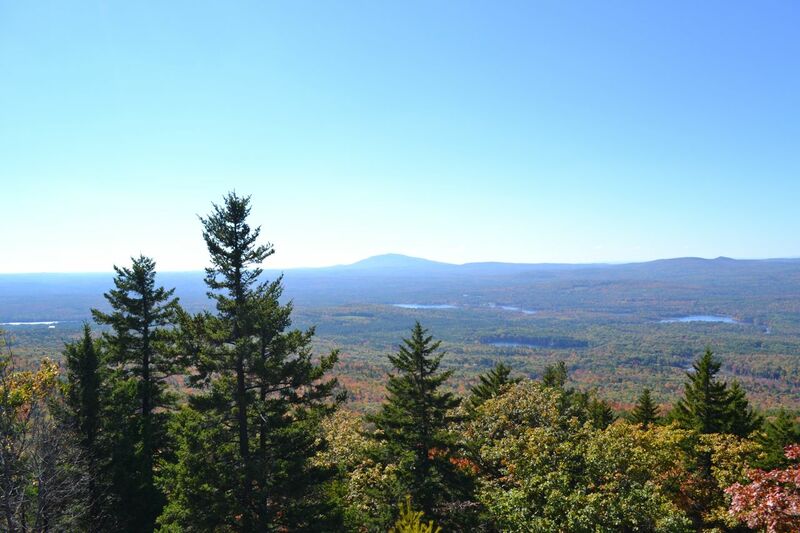 Monadnock and the smaller hills of the Monadnock Region of is obtained. The observation deck's vista is a wonderful reward for very little effort. The deck can also be reached by the handicap-accessible Greg Trail. Immediately after the platform, bear left to stay on the trail, now a faint path through the grass. It leads into the woods, renters another large cleared area, and soon re-enters the forest. 0.3 miles from the observation deck, stay straight where Lower Link comes in on the left. Shannon's Trail now traverses a flat area for a good distance before turning uphill. The trail climbs easily to a flat rocky area, then meets Bennington Trail, 0.7 miles from the last junction. Turn right, staying on Shannon's Trail. The trail now climbs more steeply and ends at the viewpoint ledge in another 0.3 miles. The ledge provides a wide view to the west that is similar to the observation deck's, but from much higher. More of the southern view has been revealed as well as several lakes in the foreground.